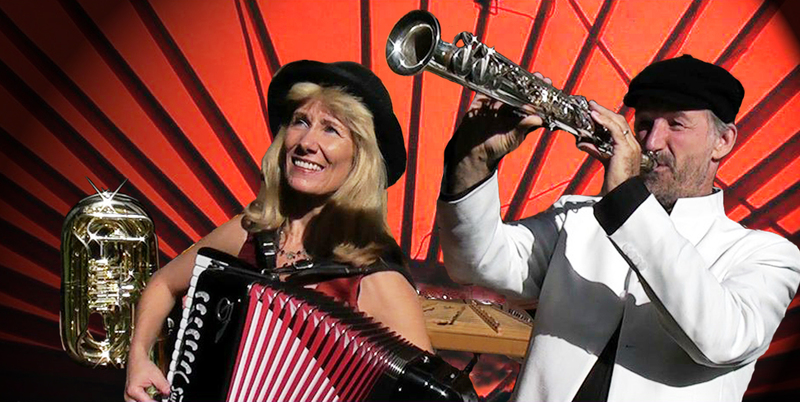 Klezmerduo is considered to be one of the finest interpreters of traditional klezmermusic in Denmark. Music which holds longing and sorrow but at the same time insisting on hope, joy and celebration. More than 25 years ago Klezmerduo were amongst the first in Denmark to kick-start the revival of the sparkling and life-affirming Jewish folk music of Eastern Europe. Nowadays they give more than 100 concerts every year in Denmark and abroad, where they have performed in most European countries and in Israel, USA, Argentina and Cuba. Being rooted in the theatre, storytelling is often a part of the performances in schools, churches, festivals, theatreprojects, at cultural events and private parties. Their performances are often described as full of nerve, vitality and humour. The musical schooling of Klezmerduo has been forged through years of travelling and performing in Eastern, Central and Western Europe and the Middle East. Playing in the streets, meeting up with musicians, actors and singers. Both Henrik Bredholt and Ann-Mai-Britt Fjord are autodidact musicians, but have had personal teachers and attended master classes – especially master classes with the famous clarinetist Giora Feidman has been of great importance. Renewing the tradition Henrik Bredholt has written new klezmertunes, some of them influenced by Danish folk music. Klezmerduo has appeared in many radio- and TV programmes and won a first price at the Danish World music festival. They have released 4 CD`s and received several Music Award nominations. KLEZMERDUO may be called nowadays klezmorim - the Hebrew word for the travelling Jewish folk musicians that enjoyed great popularity in Eastern Europe during the last centuries. The Klezmorim went from village to village, where they played their music at celebrations, especially weddings, in the homes of both Jews and Christians. Their repertoire was wide, covering both religious songs, Yiddish songs, popular tunes classical pieces - and of course dance music – all of it played “mit gefil”. 1992: Masterclass with Giora Feidman, Berlin. Musicians at the theatre performance “Sfina” in Akko, Israel. 1993: Masterclass with Giora Feidman, Berlin. Musicians at the theatre performance “The Strangers”, Denmark. 1994: Composing and performing the music in “Nigun”, a new Jewish theatreplay, Copenhagen. 1995: Concerts at the festival “Hautes Terres” in South of France. First prize at the Danish Worldmusic Festival. Carrolings and concerts in Eastern Poland. 1996: Concerts in Sweden, Copenhagen International Klezmerfestival. 1997: Releasing first CD : “Danish Klezmer ...Oy Oy Oy”. Nominated to Danish Music Award. Project in Greece. Touring the Faeroe Islands. “The way of the salt” - 200 km. of travelling theatre performance by horse wagon. 1998: Travels and gigs in Krakow and Zakopane, Poland. 1999: 33 school concerts in 3 counties. 14 performances together with the Polish group “Muzykanci” at the Århus Festival week. 2000: Concerts at “Helsinki 2000”, Finland. 2001: Releasing the second CD : “ITZIK SPITSIK”. Faroe Islands touring with Danseteatret Pulcinella. 2002: School concerts in 6 councils. Nominated to Danish Music Award Folk - 2002. Cultural project one month in Trinidad, Cuba. 2003: Cultural project in Ringkøbing Council / with The Dancetheater NordenFra. 2004: Klezmer Gallaconcert in Copenhagen. 2005: Concerts in Scotland, Edinburgh Festival. Attending KlezKamp in New York. 2006: Concerts at Louisiana Museum of Modern Art and at Amtsmandsgården in Rendsborg, Germany. 2007: Musicians at the International Storytelling Symposium in Järna, Sweden. Releasing the third CD: "Shabes Tsimmes". Nominated to World Music Award 2007. Nine weeks tour of schoolconcerts. Attending Jewish Culture Festival in Krakow. Zjeravna, Bulgaria "Musical Meetings". "KlezFiesta 2009", Klezmerfestival in Buenos Aires, Córdoba and Mendoza, Argentina. 2010: Weddingmusicians in Mexico, Nordic Storytelling Symposium in Sweden. 2011: International Theatre Festival in Poland/Belarus. 2012: Concerts in Norway. Klezmerduo 25 years anniversary. Releasing the 4. CD "A Bisele Freyd"
2013: Concert in Sweden and Poland. New Program : "October 1943 - The rescue of the Danish Jews". 2014: International Symposium, Storytelling "The tree of life" in Finland. 2015: Cultural Projects in Israel and Rumania. Concerts in Polen and in Germany. 2016: Project Eastwind, in coorperation with Halas Duo (PL). Research in Spain. 2017-18: Edinburgh Festival Scottish International Storytelling Festival, Polen, Rumania, Israel.